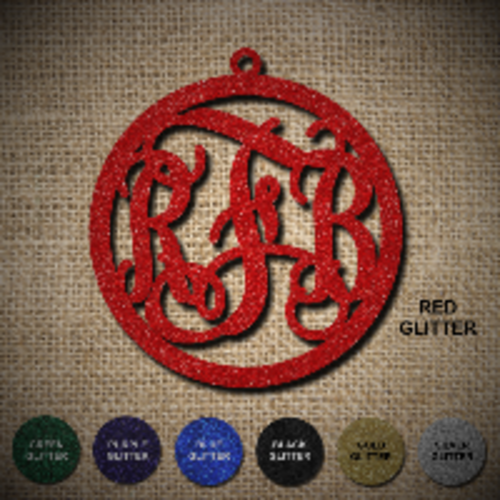 Personalized laser cut glitter acrylic monogrammed christmas ornament. We make your personalized monogramed christmas ornament to order , laser cutting your special ornament from beautiful sparkling glitter acrylic. Measures 3" X 3". Choose from Red, Green, Blue, Black, Purple, Gold or Silver glitter acrylic. Enter the letters for the custom design. We use the beautiful Vine monogram style. The majority of orders use the "FLM" format, your first name initial on the left, your last name initial in the middle and your middle name initial on the right. Simple choose the letters you want from the drop down menus for each space. This custom item usually is ready to ship in 1 to 5 business days.